Institute of Management and Technology (IMT) Enugu UNN Degree Affiliate Post-UTME Results and Admission List of Candidates Offered Provisional Admission for 2018/2019 Academic Session Out. 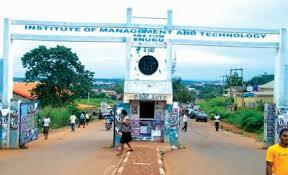 The management of the Institute of Management and Technology (IMT), Enugu, has released the DEGREE POST UTME RESULTS AND ADMISSION LIST for the 2018/2019 academic session. The admission list contains the names of candidates offered provisional admission into the various DEGREE programmes offered by the institution and has been uploaded on the institution’s admission status checking portal. Participants can now check their admission status by following the processes outlined below. Step 1 – Kindly log on to IMT Engu admission checking portal via https://portal.imt.edu.ng/SLMS.AdmissionManagement/AdmissionResultChecker/AdmissionResultCheckerVeiw. NB You can use the same pin used in checking your results to check your admission status. Successfully Admitted Students are to Accept Admission Offer by visiting the JAMB CAPS Portal, Print Admission Letter and Proceed with the payment of acceptance fee.